08.11.2017, Strasbourg - First Deputy Minister of Foreign Affairs of Georgia David Zalkaliani spoke about the situation in the Russian-occupied regions of Georgia during the 1299th meeting of the Committee of Ministers Deputies of the Council of Europe dedicated to the discussion of the 16th Consolidated Report on the Conflict in Georgia, which was prepared by the Secretary General of the Council of Europe Thorbjørn Jagland. In his speech David Zalkaliani paid special attention to the Russian Federation's steps towards the occupation and annexation of the Georgian territories, including the so-called borderization process, the closure of the so-called checkpoints along the occupation line, illegal detentions, the opening of customs checkpoints in Sokuhumi and Akhalgori, the issuance of so-called residence permits to ethnic Georgians and other issues. The First Deputy Foreign Minister highlighted the continuous discrimination of ethnic Georgians in the occupied territories. Special note was taken of mass destruction of houses of ethnic Georgians in the village of Eredvi as a deliberate attempt to wipe out the Georgian trace in both regions. David Zalkaliani expressed his concern over the banning of the Georgian language instruction, which, in addition to Abkhazia, started in the Tskhinvali region as well. According to him, the existing situation calls for immediate action by the international community and for the establishment of CoE monitoring mechanisms in the occupied territories. 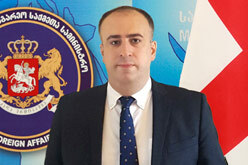 David Zalkaliani also spoke about the Georgian Government's steps towards confidence building and policy of engagement. He highlighted the importance of the Geneva International Discussions in peaceful resolution of the conflict. Statements in support for Georgia were made by the EU and GUAM. In its statement the European Union discouraged the Russian Federation for its illegal actions in Abkhazia and Tskhinvali and called upon its government to avoid illegal detention of people and ethnic discrimination, restore check-points and investigate any illegal actions that violates human rights. Delegations of Albania, Andorra, Bosnia and Herzegovina, Georgia, Liechtenstein, Iceland, the Republic of Moldova, Monaco, Montenegro, the Former Yugoslav Republic of Macedonia, Norway, and San Marino aligned themselves with the statement made on behalf of the EU. Permanent Representatives of the CoE Member States individually condemned the illegal activities of Russia in the occupied regions. They underlined the importance of access of the international monitoring bodies to the occupied territories of Georgia and called on the Russian Federation to facilitate and grant unrestricted access to the Council of Europe bodies, to the areas affected by the conflict in Georgia. The Council of Europe Member States positively appraised the Georgian Government's constructive approach to the peaceful resolution of the conflict and its peace initiatives. They also expressed their support for the Geneva International Discussions. The Secretary General's 16th Consolidated Report was welcomed by the Council of Europe's member states, which supported the practice of submitting the Secretary General's consolidated reports in the future. Only the delegation of the Russian Federation called into question the effectiveness of the Secretary General's consolidated reports. The Ministry of Foreign Affairs of Georgia welcomes the publication of the Council of Europe Secretary General's 16th consolidated report as well as the statements made by the EU, GUAM and other partners concerning the report. The Ministry hopes that the issue of the "Conflict in Georgia" will remain high on the Council of Europe's political agenda. CoE Secretary General Thorbjørn Jagland's 16th consolidated report covers the period between April and September, 2017. The report has been published twice a year since 2010.